The diamond is the best known and the most heavily marketed gemstone. Like graphite, lonsdaleite ("hexagonal diamond"), and the fullerenes, a diamond is an allotrope of carbon and, no matter what its size, each diamond can be considered to be a single molecule of carbon. 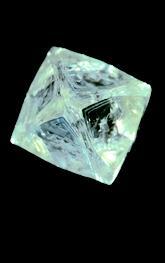 Diamond is the hardest natural substance (while carbon is one of the softest). The word diamond derives from Greek adamas or "hardest steel". Pliny the Elder (A.D. 23 to 79) wrote that "the best way to test adamas is upon the anvil; strike even upon the point of the adamas with a hammer as hard as you can, it defies all blows and instead of the stone yielding, the hammer flies into pieces and even the anvil splits in half." This experiment, however, is not recommended: though hard, a diamond is brittle, and can crack under the shock of a sudden, sharp blow. Diamond has an isometric crystallography. The crystal structure of a diamond, called a face centered cubic lattice, derives from the way each carbon atom joins four other carbon atoms in regular tetrahedrons (triangular prisms). It is possible to cleave, or split, a diamond, along its crystal face (grain), such that each side of the cleavage remains smooth. The adamantine luster (the brilliance and "fire") of a diamond is due to its high dispersion and its high refractive index (a measure of how far it can bend light). Commercial gem diamonds are colorless or pale, steely blue. Strongly colored gem diamonds, called "fancies," are extremely rare and valuable (especially red, pink, and blue). Diamonds can also be gray, yellow, brown, green, orange, lavender, and even black. Diamond crystals frequently contain inclusions of other minerals. Many diamonds fluoresce blue to violet and the effect is sometimes strong enough to be seen in daylight. Some blue-fluorescing diamonds phosphoresce yellow (afterglow reaction). Diamond has a high specific gravity. A diamond does not conduct electricity well (it is a semiconductor), but conducts heat extremely well. At a high enough temperature in the presence of oxygen, diamond can burn.